With a birthday over the Christmas break, B’s school celebration either gets bumped up or moved back. This year, I asked the teacher if we could do it in January. With so much happening in December, I felt like her birthday wouldn’t feel as special. Thankfully, she was happy to do that, so the week back it was. While trying to find an afternoon that worked with a crazy schedule, I realized I’d have to bump it back for two more weeks. Thankfully, her teacher suggested a morning celebration with donuts. That’s a win! B loved her birthday donut celebration with her friends. She felt special and loved and everybody loved the donut treat. 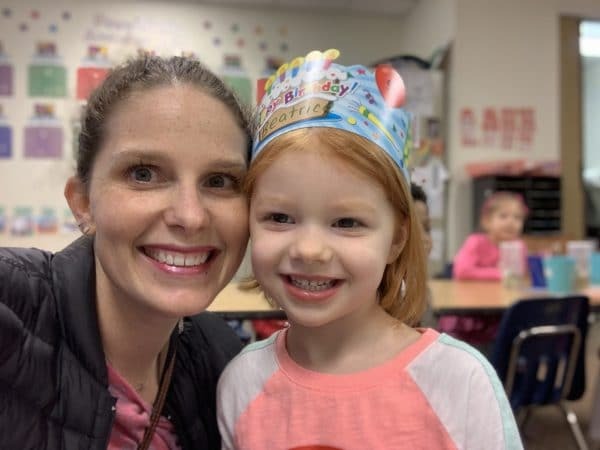 It’s quite bittersweet as this is her last preschool birthday celebration and next year we’ll have to figure it out in kindergarten. But, there might have been a promise of daddy coming so we’ve got that to look forward to!